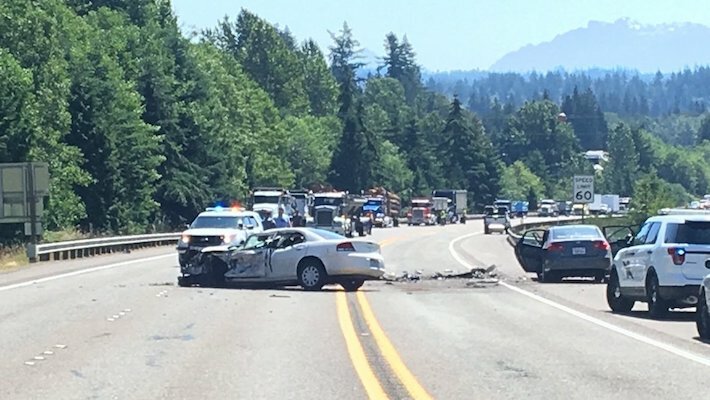 A suspected DUI driver caused a serious injury collision Monday morning in Gold Bar, a crash that shut down US Highway 2 for more than three hours. The crash occurred about two miles north of the city of Snohomish. The Washington State Patrol said a driver heading west on US-2 just east of Highway 9 crossed the center line and hit a pickup truck hauling a trailer. The trailer detached from the pickup and rolled down a 30-foot embankment. Meanwhile, the causing driver went on to hit the vehicle behind the trailer head-on. The 46-year-old California woman driving that car suffered critical injuries and was transported to Providence Hospital in Everett. The causing driver, a 23-year-old Brewster man, was not injured. He was arrested for driving under the influence of drugs and was booked into Snohomish County Jail on a vehicular assault charges. A fourth vehicle sustained damage from flying debris. While Washington state does not have punitive damages, the civil justice system allows victims to recover financially after an accident. Oftentimes that means filing a personal injury lawsuit against the at-fault driver’s insurance company. While not always necessary, a personal injury attorney may be able to help you protect your right to the full recovery of costs associated with a motor vehicle accident. You must make sure to prove future as well as past and present damages. After serious accidents, you may require continued medical care, requiring you to present an estimate of the future medical costs, often through the medical opinion of a treating physician. Other expenses that would not have been incurred you had not suffered serious and life-changing injuries may also be compensated, such as the cost of hiring someone to perform necessary housework or child care while you recover. Proving the full extent of the injuries is important, as is carefully tracing the conditions to the underlying accident. If you or someone close to you has been injured in a collision caused by a drugged driver, the motor vehicle collision lawyers at Davis Law Group, P.S., can help you assert your legal rights. We understand the emotional impact of a car crash and are prepared to pursue full compensation on your behalf. Throughout the legal process, we provide compassionate, thorough, and personal attention. To schedule a free, no-obligation case evaluation with a Washington state drugged driving accident attorney, call us at (206) 727-4000 or contact us online. We help victims and their families across Washington state.